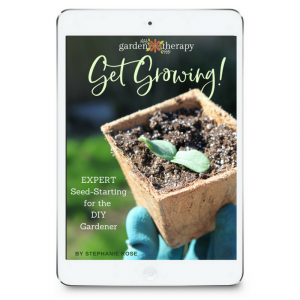 You do not need to be an avid gardener to become a master sprouter! No soil or direct sunlight required—you only need what is supplied in this kit plus water and a few days on a countertop. 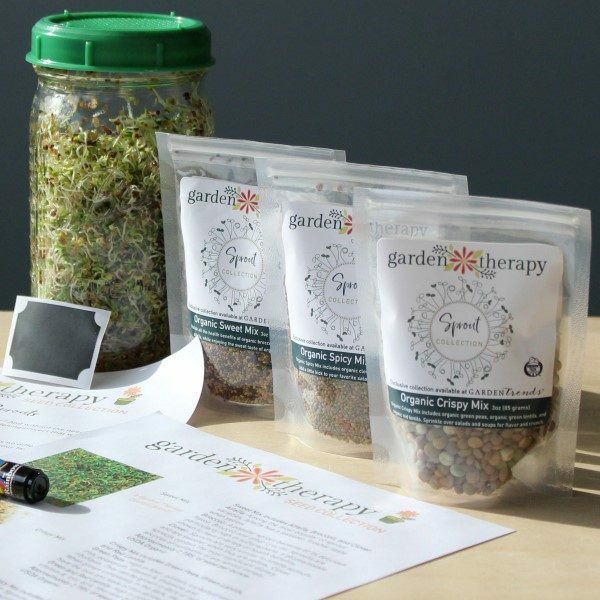 The limited edition sprouts kit comes with three sprout mixes, including Organic Sweet Mix, a Garden Therapy custom blend, Organic Crispy Mix, and Organic Spicy Mix. Each packet contains 3 oz. (6 tbs. ), the perfect amount to sample each mix. 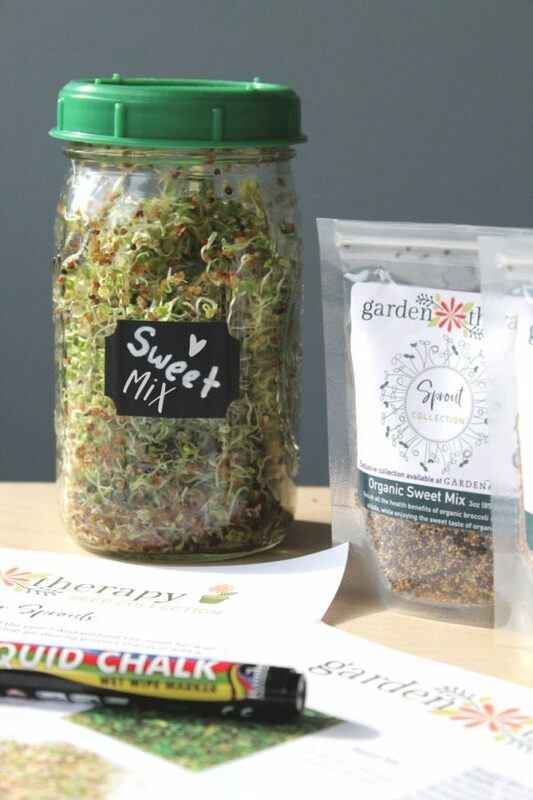 Organic Sweet Mix includes the ABC’s of sprout sweetness: alfalfa, broccoli, and clover. When I created this custom blend I wanted to call it Nutrition Blend because it has such a balance of healthy sprouts, but in the end taste won out and I called it Sweet Mix. Either way, you’ll love both the taste and the health benefits. Organic Crispy Mix includes green peas as well as green and red lentils, providing you with a punch of fresh flavor and crunchy texture perfect for salads and soups. Organic Spicy Mix includes clover and radish, leaving your taste buds buzzing with a rich, bold, and zesty tang that perks up sandwiches and salads. This is the fastest edible garden ever! In just 3-5 days after receiving the kit, you will be adding a healthy garnish to sandwiches, soups, and salads with sprouts! New to sprouting? This is the perfect beginner kit for you! Easy-to-follow instructions are included with each kit to ensure your sprouting success. Did I mention it that only 2 tablespoons. (1 oz.) of mix is needed to fill a Mason jar, in just 3-5 days? See the picture above? That was 2 tablespoons just 5 days before. 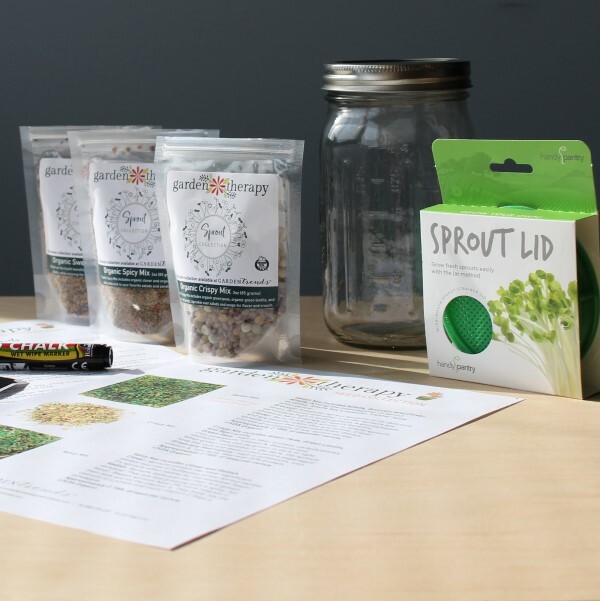 This kit gives you up to 8-9 full Mason Jars of sprouts. I hope you are hungry! 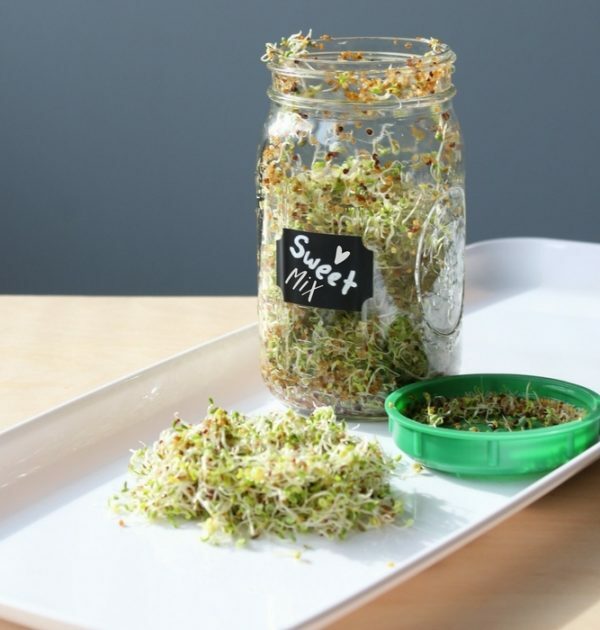 Sprouting is a great way to keep motivated about healthy eating as the results are so quick and the taste is so addictive. Winter Schminter. 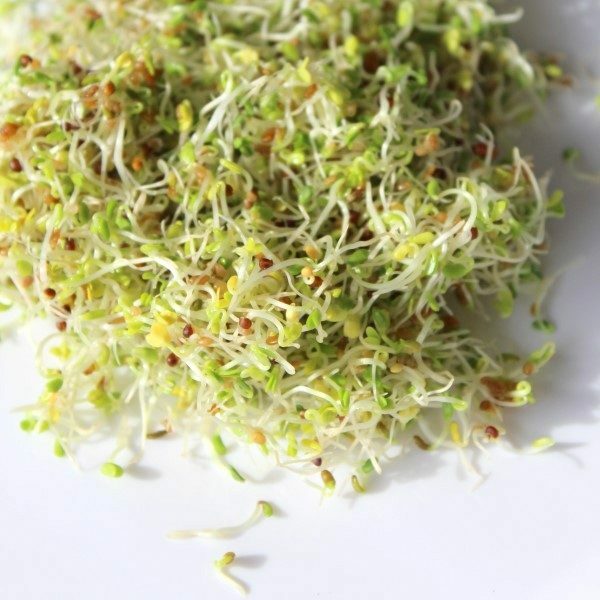 Sprouts can be grown in any season, filling up your plate with fresh green vegetables in winter, spring, summer, and fall. This is also a perfect edible gardening project for apartment dwellers looking for a simple, green activity that won’t take up much space or time. The Mason Jar and Mason Jar lid can be thrown in the dishwasher for easy clean up. Just remove the chalk label first. 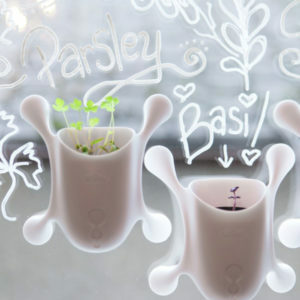 The chalk label and chalk writer look great but also keep your sprouts organized. Write the type of sprouts and the date you started them so you also know the date you need to eat them by. The Mason jar, Mason jar sprouting lid, chalkboard label, and chalkboard pen can be reused over and over again; only leaving you to replenish your favorite sprout blends once you use up each drop- which, trust us, you will! For more details, check out this blog post. 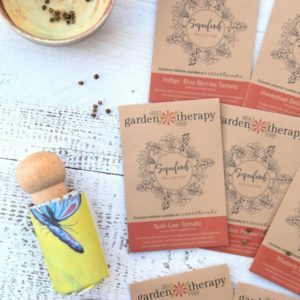 See a copy of the seed-starting and culture guide.